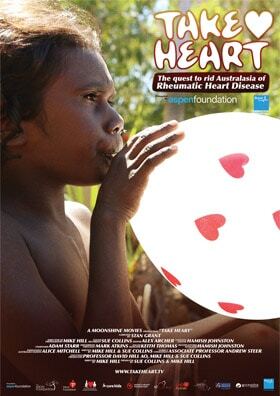 Take Heart is lifting the lid on Rheumatic Heart Disease (RHD) across the nation. ABC News, feature by Kristen Veness with Liddywoo Mardi, Dr Bo Remenyi and Mike Hill. SBS TV, feature by Sarah Abo with Liddywoo Mardi, Dr Bo Remenyi and Mike Hill. Nine News Darwin, feature by Henry Jones with Mike Hill and Trenton. The Guardian, feature by Melissa Davey. ABC Radio National PM, feature by Rachael Brown with Liddywoo Mardi, Dr Bo Remenyi and Mike Hill. 3RRR Hullaballoo, Dan Keely interviews Mike Hill. ABC Radio National Breakfast, feature by Fran Kelly with Dr Bo Remenyi and Mike Hill. The Australian, review by Greame Blundell. ABC, feature by Katherine Gregory with Liddywoo Mardi, Dr Bo Remenyi and Mike Hill. NITV News, feature by Sarah Abo with Liddywoo Mardi, Dr Bo Remenyi and Mike Hill. The Age, feature in The Green Guide. ABC News 24, feature by Rachael Brown with Liddywoo Mardi, Dr Bo Remenyi and Mike Hill. The Blue Room, feature by Dr Rob Grenfell. ABC 774 The Conversation Hour, Jon Faine interview with Associate Professor Andrew Steer. Beat, cover story featuring Elizabeth Still and Mike Hill. RHD on ABC TV News, by Margaret Burin. Sydney Morning Herald, feature in TV Guide. ABC TV News Breakfast, story by by Kristen Veness with Liddywoo Mardi, Dr Bo Remenyi and Mike Hill. ABC 774 Breakfast, Red Symons interview with Dr Bo Remenyi and Mike Hill. Radio Light FM, In Conversation with Clayton, interviews Mike Hill. ABC Radio National Awaye, feature by Rico Adjrun with Liddywoo Mardi, Dr Bo Remenyi and Mike Hill. 3NRG, Movie Show, Peter Krausz interview with Mike Hill. Koori Mail, feature by Rudi Maxwell with Mike Hill. National Indigenous Radio Service, feature with Dr Bo Remenyi. ABC Radio Darwin, feature with Dr Bo Remenyi. 3WBC, Movies at Dusk, Greg King interview with Mike Hill. The Guardian, podcast featuring Melissa Davey. NACCHO (National Aboriginal Community Controlled Health Organisation) Newsletter, feature story featuring Vicki Wade, Dr Rob Grenfell and Mike Hill. Australian Doctor, Picture of the Month write-up by Stacey Shipton. Mojo (Monash Journalism), story by Luke Mortimer. The Health News, Health Professional Radio, bulletin featuring Dr Bo Remenyi, Liddywoo Mardi and Mike Hill. Fat Mum Slim blog, feature by Chantelle Ellem. ABC News Breakfast Weekend, live interview by Andrew Geoghegan & Miriam Corowa with Dr Bo Remenyi. The Guardian Australia, First Dog on The Moon, Cartoon.